Over the last decade, states have made massive cuts to higher education, with average state support falling from $9,729 per student in 2001 to $6,815 in 2011. While a large share of the blame for these cuts can be pinned on the financial crisis and subsequent recession, some of the decline is due to a deliberate effort to eviscerate public higher education. For instance, Bobby Jindal plans to savage higher education spending in Louisiana to the tune of $141.3 million, or about 12 percent of the state’s higher education budget, to pay for tax cuts. In Wisconsin, Scott Walker is cutting $300 million over two years, again to pay for reckless tax cuts. Kansas is an even sadder story. Though the state had a large reserve fund in 2012, Governor Sam Brownback quickly depleted it with a massive tax giveaway to the rich. Now he’s cutting K-12 and university funding to the tune of $44.5 million. 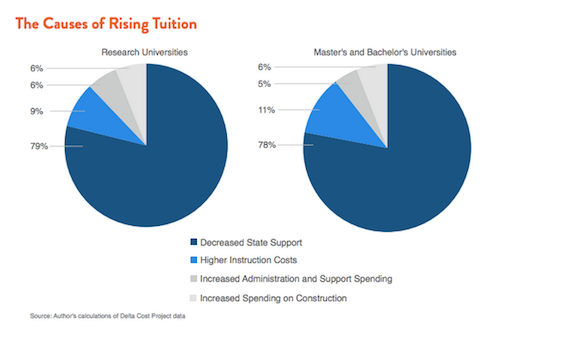 There’s a good reason our list of governors seeking deep cuts is shaded a uniform red: Both research and history shows that Republican-controlled states are more likely to cut higher education. One study found that when Republicans take over governors mansions they reduce spending on higher education by $0.23 per $1,000 in personal income (a measure of the state’s total tax base). Each 1 percent increase in the number of Republicans in the legislature leads to a $0.05 decrease. 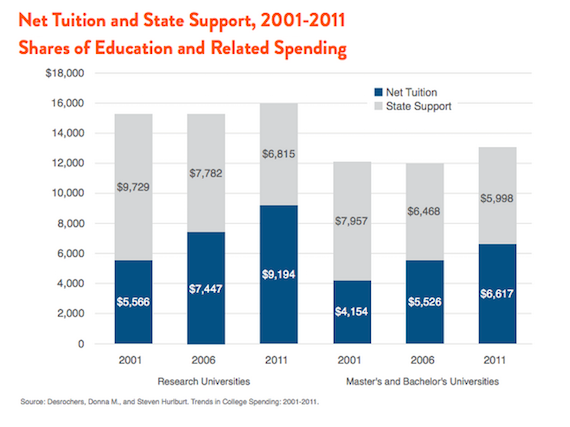 Given that the average spending on higher education across all states in 2014 was $5.47 per $1,000, the effect is large. Nationwide, the total impact of these cutbacks is breathtaking. Between 2008 and 2013, states cut a total of $16 billion, adjusted for inflation, from their higher education budgets, even as enrollments rose more than 11 percent. Funding per student dropped even more dramatically, falling by more than 27 percent, or about $2,500 per student. These cutbacks, in turn, have translated nearly 1-to-1 into tuition increases, which averaged nearly $3,000 over the past decade. But the question is not simply deficits, but priorities: Just seven months of funding for the F-35 Fighter would be enough to fully restore higher education spending across the nation. These cuts are particularly shortsighted because the benefits of higher education, both for individuals and society at large, pay for the cost of investment many times over. The body of research on the impacts of higher education is massive, but their consensus is that increased higher education impacts nearly every corner of society, from increased economic growth to lower crime, better health, greater civic participation, and even childhood development. A few highlights: One study found that 8.7 percent of all economic growth between 1959 and 1998 could be attributed to increased education. Other studies have found that increased higher education leads greater rates of voter participation, to the tune of 22 percent; a 15 percent reduction in crime, and better cognitive development among children of parents with college degrees. Robbie Hiltonsmith is a Senior Policy Analyst at Demos and author of "Pulling Up the Higher-Ed Ladder: Myth and Reality In The Crisis of College Affordability."